From Mega house. From the classic video game metal gear, Rex storms into your collection with generous articulation & weaponry, plus two D-Spec scaled figures. Kidrobot x Elvis Preseley Graceland – Elvis Vinyl Figure?! Debuting at last weekend’s DesignerCon 2014 was INNER CHILD from nerviswr3k, and the first vinyl produced by SubUrban Vinyl! Three colorways revealed thus far for this 4″ tall figure, with Green to be released in store and online by SubUrban Vinyl exclusively, while the Blue edition is an exclusive to Tenacious Toys (Limited to 150pcs @ US$45 each)! Plus, there’s a rumor that more DC Comics super heroines will be added to the toy line. My only regret in posting this is that I don’t know how tall these figures are. But they do look pretty cool and I just might have to get that one of the Catwoman, MEOW! OK, I actually want all three, ha! 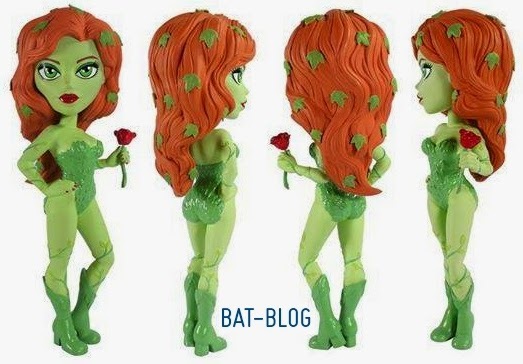 PopVinyl.net is reporting that Funko has announced a new Vinyl Vixens line, which is set to premier with Batman babes Poison Ivy, Harley Quinn, and Catwoman. The line, which apparently draws inspiration from pin-up art, will appear at Hot Topic and other retailers in coming months.